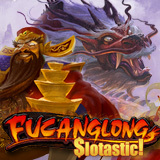 With Chinese New Year just around the corner, Slotastic has just added the new Fucanglong slot from RTG to its online casino and mobile casino. Until the end of the month, they'll give you 50 free spins on the new game and they'll double your deposits (up to $333). In ancient Chinese mythology, the Fucanglong dragon guards treasure hidden underground. He waits deep in the earth protecting his hordes of jewels, especially his magic pearl. He only surfaces when the gods summon him, creating fiery volcanoes when he does. Online casino giving 50 free spins on new dragon-themed slot game. In this new “all ways pay” slot from Realtime Gaming, Dragon Mountain scatters initiate free spins with frequent re-triggers adding extra games and up to 8X prize multipliers. Pearls trigger a free game feature where a precious Pearl hides a prize of 3X to 88X the triggering bet. If the win from the free games hasn’t reached the Pearl number, the Fucanglong Feature is triggered. During the Fucanglong Feature Wilds expand to cover the entire reel and increase chances of a winning combination. Bonuses are valid until January 31, 2017 only. Slotastic specializes in real money online slots games, offering hundreds of slots from Realtime Gaming as well as casino games like blackjack and roulette.